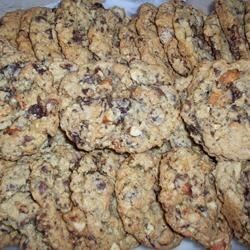 "Nutty and super chocolaty cookies that use three kinds of chocolate chips. If you love chocolate as much as I do, you will love these cookies. Hope they last more than a day!!" Preheat oven to 350 degrees F (175 degrees C). Grease or butter cookie sheets. In a small bowl, toss together almonds, bittersweet, semisweet and milk chocolate pieces, and oats; set aside. Sift together flour, baking powder, baking soda, and salt; set aside. In a large bowl, cream together butter, brown sugar, and white sugar until smooth. Beat in eggs one at a time, then stir in the vanilla. Stir in the flour mixture until just blended; Mix in oats, nuts, and chocolates. Drop dough by tablespoonfuls onto the prepared cookie sheets. Bake for 12 to 15 minutes in the preheated oven. Allow cookies to cool on baking sheets for 2 minutes before transferring to a wire racks to cool completely. This is a good oatmeal chocolate chip cookie. I prefer bigger chunks of nuts so I did a rough chop on whole almonds. Thanks for the post. These were oh sooo yummmy, I sub the bittersweet chocolate for white and I made a double batch for a work party and these were the first to go!! Excellent. I used maple syrup (the good stuff) instead of vanilla extract. Delicious! Made a couple changes; replaced 3/4 c of flour with cocoa & used a combination of white chocolate chips, chopped milk & very dark chocolate bars......wow...Yum!! !